Jon Stewart started his final week as "Daily Show" host by taking on a familiar foe: Fox News. The cable network had recently labeled Stewart a "propagandist" over his White House meetings with President Obama, a charge the satirist was not about to let slide. "They didn't seem to support their assertions with ... umm ... evidence," Stewart said of Fox News. "You like to nail me as a propagandist, you could have just shown a clip of me shamelessly pimping for some signature policy like Obamacare." Stewart then played a clip from a 2013 interview with Kathleen Sebelius, in which the host challenged the former secretary of Health and Human Services to sign up for Obamacare in less time than it took him to download "every movie ever made." Stewart then showed clip after clip after clip of Fox News hosts pointing out when the "Daily Show" host was hard on Obama, followed by times in which Stewart felt Fox News was coerced by politics. Stewart ended the segment with a few more shots at the cable news network. "Hypocrisy isn't a bug in the Fox model, it's the feature," Stewart said. "You job is to discredit any source of criticism that might hurt the conservative brand by angrily holding them to standards you yourselves jettisoned in your news network's mission statement." Stewart added that his hunch was that "The Daily Show" had been harder on Obama than Fox News ever was on President George W. Bush. The departing host then threw an imaginary grenade and yelled "adios, mother f***ers!" as a fake explosion was shown on the screen behind him. "Jon, you got three more shows left," a voice said over the loud speaker in the studio. Stewart then proceeded to put out the fake flames behind him with a fire extinguisher. 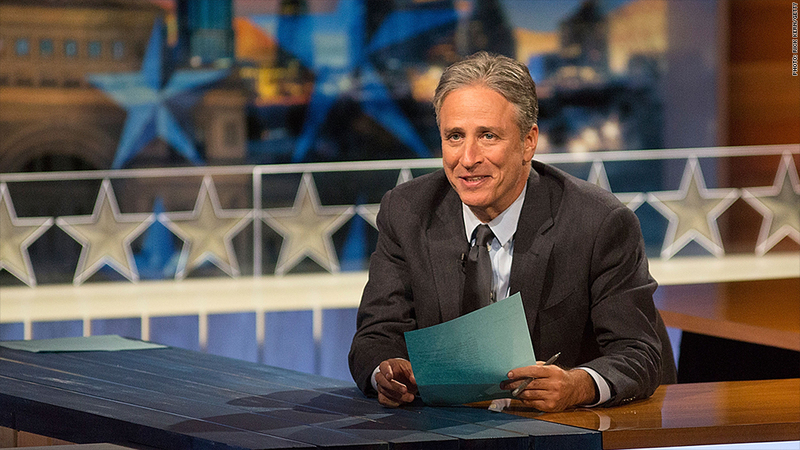 After 16 years as "Daily Show" host, Stewart signs off on Thursday.